After you’ve added containers to a container host, you can rename a container, change the run state of each container individually, view details about each container, and delete containers. (Rename this container) – Change the name of this container. (Start/Unpause this container) – Start a container or resume this container. (Pause this container) – Pause this container. (Restart) – Stop and re-run this container. (Kill) – Abruptly force stop this container. 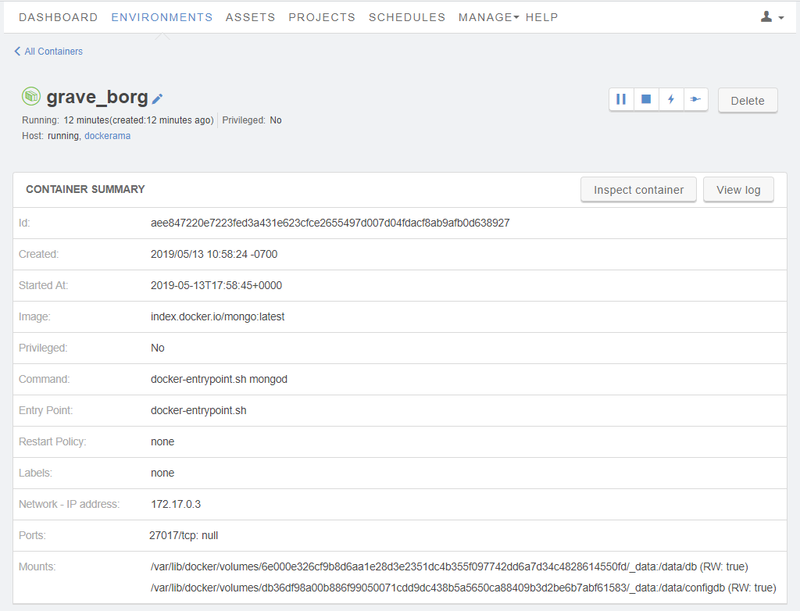 (View log) – View the most recent entries to the log file for this container. For more information about what information is logged, see docker logs. (Delete) – Delete this container from the container host. The container summary page displays detailed information about a container and provides controls to change the run state of the container. (Inspect container) – View the docker inspect report for this container. Choose the number of lines to view from the drop-down. ID – The full ID of the container. Created – The date and time that the container was created. Started At – The date and time that the container was last started. Image – What image created the container. Privileged – Whether this container runs in Privileged mode. Command – Arguments fed to the ENTRYPOINT. Entry Point – The command that is always executed when this container starts. Labels – Docker metadata labels attached to this container. Network - IP address – The IP address of this container. Ports – Port bindings for this container. If you have mapped a host port to this container (see Port mapping), you can connect a Skytap published service (see Accessing VMs with published services) to this container. Mounts – Filesystem mounts for this container.